What type job can you get on our island? There are only a few employers on the island. The government (police, school, bus driver) and an ice plant. Outside of that every one is in business for himself. There are shop owners that employ a hand full of people and guest houses that are very seasonal with all of them are family run. 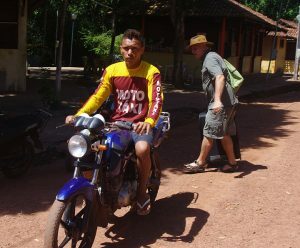 Motorcycle taxi driver is the most popular trade here. The island is crawling with them on popular weekends. Yes, we are a local tourist spot. We have 14KM of beaches at low tide, that people can walk on the beach or sit at one of the many restaurants that line the beach. This means the weekend is busy for the locals. There is jobs here but most of them are service jobs that are part time. Many people have to find some other self employment during the off season just to get buy. As they say it is a great place to visit but not to live here.